Radboud University Nijmegen launched the Rembrandt Documents Project (RemDoc) to provide a much-needed infrastructure through which all documents that are relevant for the study of Rembrandt will be accessible for the first time in a way that is suitable for modern art history. The heart of the RemDoc infrastructure will be original documents from the period between 1475 to circa 1750. RemDoc will not feature later original Rembrandt documents because, following 1750, their nature changes significantly. Texts become increasingly interpretative rather than factual, and attributions of paintings in auction catalogues rapidly become less reliable. RemDoc aims to collect and make available all known documents that relate to Rembrandt, as a person and as an artist, as well as to his ancestors and relatives. The RemDoc project subscribes to a modern and inclusive definition of the term ‚document‘. Therefore, RemDoc will, for example, include extracts from baptism, marriage, and burial records; the small number of Rembrandt’s own letters; notarial deeds such as contracts, probate inventories, debt and credit records; as well as inscriptions on drawings and etchings by Rembrandt, his patrons, and collectors. RemDoc will also contain advertisements of auctions in newspapers and references to Rembrandt in contemporary poetry. All documents will be transcribed and annotated by and under the supervision of professor Volker Manuth and Jaap van der Veen, and will be translated to modern Dutch as well as English. The number of original documents identified for the RemDoc initiative today includes circa 1500 items. RemDoc’s main value, however, is not the size of the document collection, but rather the depth to which the documents will be linked and the ease with which they will be accessible. 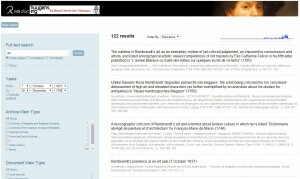 RemDoc will also provide links to the large collection of writing about Rembrandt published after 1750. Last but not least, the RemDoc infrastructure will provide a gateway to other databases and digital collections that contain images and physical data about Rembrandt’s works of art. RemDoc will be interoperable with existing and future digital research platforms for art historians. The digital laboratory www.remdoc.org, with possibilities to search and browse the Rembrandt Documents, has been developed by Huygens ING.